A stay at Sunlight Hotel places you in the heart of Istanbul, within a 10-minute walk of Grand Bazaar and Hippodrome of Constantinople. This hotel is 0.6 mi (1 km) from Sultanahmet Square and 0.6 mi (1 km) from Hagia Sophia. 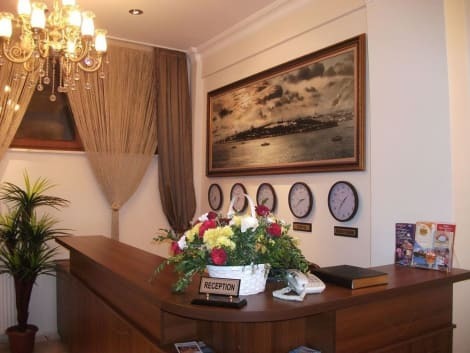 Located in Istanbul (Sultanahmet), Art City Hotel Istanbul is within a 10-minute walk of Sultanahmet Square and Grand Bazaar. This hotel is 0.5 mi (0.8 km) from Blue Mosque and 0.5 mi (0.9 km) from Hagia Sophia. Featured amenities include complimentary wired Internet access, complimentary newspapers in the lobby, and dry cleaning/laundry services. A shuttle from the airport to the hotel is provided for a surcharge (available 24 hours).